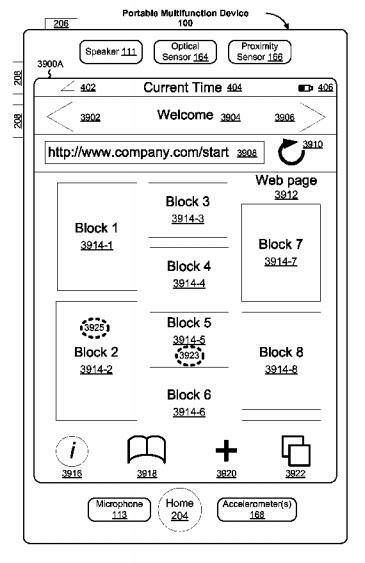 In the patent language, Apple refers to graphical assets being "substantially centered" on a portable device's display. Samsung argued that the term was indefinite and thus the patent should be invalidated. Judge Koh disagreed and denied the invalidation by citing a number of federal court cases that set precedent pertaining to the term "substantially." She also noted a bevy of legal minutiae regarding how patents are to be filed and how they are deemed valid when denying indefiniteness claims against Apple's U.S. Patent No. D618,677, No. D593,087, No. D604,305 and No. D504,889. In sum, the Federal Circuits cases establish that precise construction is not required, or even permissible, when a patent uses a term of degree such as substantially, and the specification does not provide a standard for measuring the precise boundaries of that term of degree. Moreover, the evidence suggests that persons of ordinary skill in the art can understand the meaning of the term substantially centered. Accordingly, the Court finds that the term substantially centered is not ndefinite. Update: In a late filing on Tuesday, Judge Koh further addressed Samsung's JMOLs, including one that sought a new trial, but overturned a jury decision that said Samsung willfully infringed on Apple's patents. Most important of the JMOL order was the overturning of the Apple v. Samsung jury's finding that Samsung willfully infringed on Apple's patents. Just as in Judge Koh's previous ruling, a two-pronged analysis, objective and subjective, was taken in constituting patent infringement. As explained by FOSS Patents' Florian Mueller, "The likelihood is objectively high if this is what someone knowing the patents and all other relevant facts would think so; it's subjectively high if the infringer actually knew these facts or if they were so obvious that he should have known." The jury found Samsung was subjectively willful in infringing on three Apple utility patents and two design patents, but Apple still needed to provide an "objectively high" likelihood of willfulness as decided by the court. In each instance, Judge Koh found a defensible position for Samsung, and thus overturned the subjective jury findings. While Samsung was granted the willfulness JMOL, the court denied a motion for a new trial because the original proceedings were "manifestly unfair." Samsung argued that it had been negatively impacted by time limitations, the court's admittance of Apple references to witnesses Samsung did not call, unfair barring of witnesses, unfair barring of advertisements and not being able to cross-examine Apple's witnesses while Apple was allowed to do. Judge Koh noted in the Tuesday that Samsung had the option to put its own set of claims against Apple on a separate track than the Apple v. Samsung jury trial, but chose not to do so. She also said that both parties were given equal opportunities regarding time allotments and witness testimony, alluding that the proceeding were fair. "Accordingly, the trial was fairly conducted, with uniform time limits and rules of evidence applied to both sides," Judge Koh wrote. "A new trial would be contrary to the interests of justice."